However, the magazine perfectly complements a book I had just read: “Halving it all – How Equally Shared Parenting Works” by Francine M. Deutsch. Deutsch is a social psychologist who investigates the role of gender in everyday life. 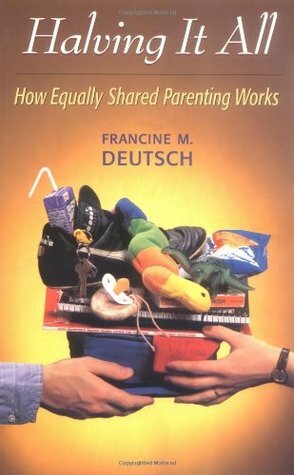 In her book, Deutsch describes the results of an extensive study she conducted on “equally sharing couples”, that is, both partners work for at least 20 hours a week for pay and have at least one child under the age of 18 living at home. During hour-long interviews with 150 couples Deutsch explored the roles of both partners. Outdated gender stereotypes and expectations seem to be the main culprit. We live in a world in which women have the same access to education and the right to equal work opportunities, but have retained outdated gender expectations. Many men still perceive their role to be the breadwinner, and perceive care work as failing at manhood. Similarly, women often feel the pressure to adhere to gendered expectations: A good mom is supposed to stay at home to spend time with the children. One interviewee from Deutsch’s study summarizes this discrepancy when he reports that he rationally agrees with equal opportunities, but that emotionally he would prefer a traditional stay-at-home mom for his children. Frequently, these stereotypes are self-fulfilling prophecies. The assumption that the man is more ambitious leads many couples to make important decisions with the man’s, rather than the woman’s, career in mind. Even in cases where both partners have the same initial earning potential, many couples prioritize his career over hers, and hence create a situation where he earns more than her. This, in turn, makes the decision for the woman to stay at home appear economically sensible. Equally, many couples automatically assume that men are less skilled with children than are women. In accordance, many men engage less frequently with their babies than do their female partners. Missing out on valuable opportunities to practice, it is then not surprising that mothers develop better skills in these domains. I am convinced that initiatives like the Men’s Health Dad magazine will spur this trend. It shows that men are as good (or bad) at parenting as are women, and that they can gain just as much satisfaction and pride from it. It communicates that childcare is a topic men can and should discuss – thumbs up Men’s Health!